Doom by ID software was the game which put 1st person shooters on the map. 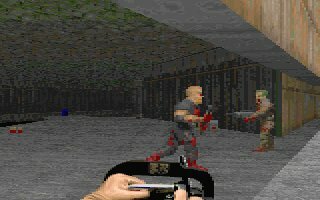 Though Wolfenstein was the first, Doom introduced many important new features: Non-orthoganal walls, lighting, better AI, multiplay, full texture mapping, and a chainsaw. The psuedo-3d engine made the graphics the best yet seen on the PC. One of the great things about Doom was the ease with which it can be modified. There are many editors and utilities about to enable you to change just about everything from the levels to the graphics and sound This was particlarly usefull for making deathmatch arenas. Pictured here is Deu - a Doom map editor. Many 'wads' are available with multiplayer levels not dissimilar in design to quake3's arenas.